Last week, I decided it was time to reorganize my guided reading groups. My kids have made so much progress since the beginning of the year and their groups needed adjusted. Some kids jumped up several reading levels and needed to move out of one group and into another. That's what I love about flexible grouping in guided reading. The kids aren't "stuck" in one group. I can move them around easily depending on their needs at that time. It was crazy! You can't tell in the picture but I also had books on the window ledge, books on chairs, books everywhere! After putting all the books together, I bundled them up and placed them in the red bins that I use to keep my guided reading groups' books in. It was so exciting to move up levels for each group and get rid of the lower books altogether. 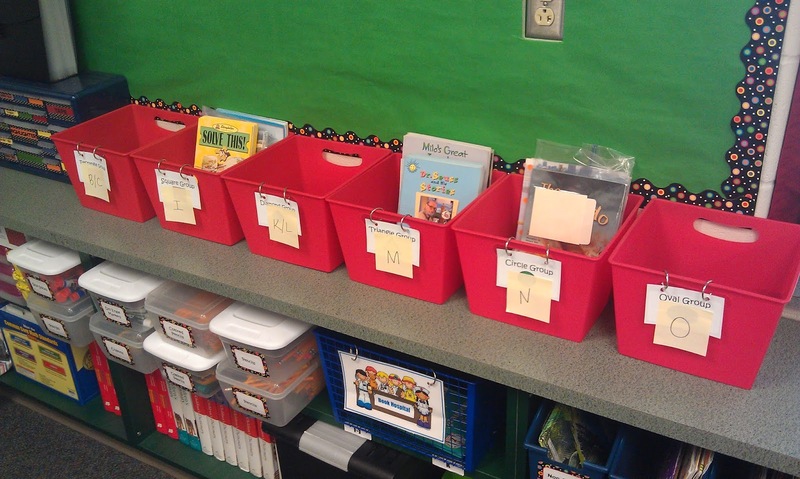 I used post-its to help me remember the level of each group while I was putting the books in the bins. (And yes... if you can read the post-its, I have a span of level from C to O!!!) 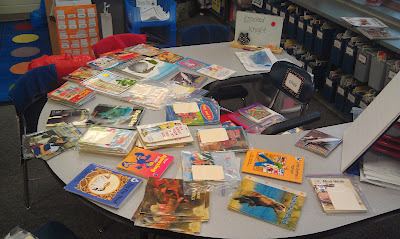 Now we are all set for guided reading groups this week with new groups and new books! Woo hoo! Last week, we had an in-service about guided reading and one of the points that was brought up was that interactive writing can and should be incorporated into guided reading. To be honest, this is something that I hadn't really thought about and wasn't doing. I really liked the idea of having a 5 minute lesson using interactive writing at the end of guided reading with each group. The only problem was that I didn't have any sort of chart paper to use that was small enough for my guided reading table. My teammate, Casi, and I were brainstorming and thought that it would be easy to just cut a regular sized chart paper tablet in half. I already have a table pocket chart at my table, so I could just put the chart paper over it. Here's a couple pics of the table pocket chart before and after. 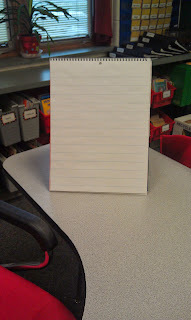 I'm so excited to start incorporating interactive writing in my guided reading groups. I think it will be especially beneficial for my lower readers and writers! Wow, you are on it! Nothing like monitoring their reading & constantly assessing! You will have great reading growth!! I do a similar system with book boxes except I have the kids keep their guided reading books and books they shop for in the one box. My kids just bring thier book box to guided reading with them. I would love to know what kind of writing activity they suggested at your inservice because I am always looking for ways to improve guided reading. Love reading your blog! I love the interactive writing idea for guided reading. 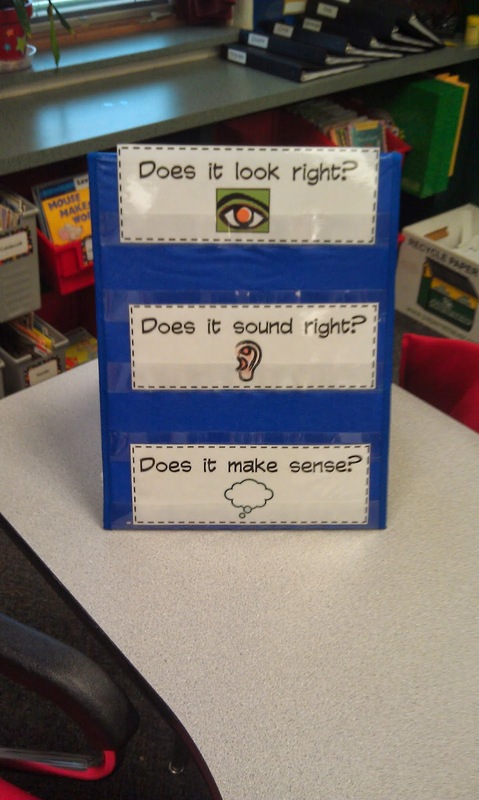 It's a great way to promote reading and writing with one activity. Thanks for sharing. :) And I can't wait to use the mini-chart paper idea at my reading table..it's genius! I'm your newest follower. I'm looking forward to visiting again soon!